Small Tanaka Reina hand fan; back of the fan has Alo-Hello logo. Dimensions: roughly 4 1/2 inches at widest, 4 inches in height (not counting fan handle), 2 1/2 inch handle. Two of this item are available, listed in separate auctions. Both have crease across Reina’s face from the way the fans were produced. Bought from the Hello! Project Information Village in Waikiki, Hawaii around 2005. A great addition to your Jpop collection! This auction item available only in United States and Canada. I couldn’t believe I had two of these. I mean, really? 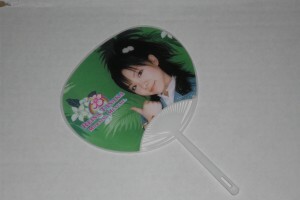 Couldn’t I have picked up a Tsuji fan instead, or a Konno? (Hey, wait, DID I pick up a Tsuji fan at some point…? Maybe I should dig around some more.) Anyway, I look at these fans and see how cute Reina was when she was relatively new to the group, and remember, “Oh yeah, THAT’S what I fell for!” Anyway, these ARE pretty nifty and quirky, and while the crease across Reina’s face in both is unfortunate, it’s not noticeable from even a short distance and is a consequence of how it’s made. (Kago’s face lays between the creases, FYI.) She’s become one of the most integral members of Morning Musume, and these fans are a nice reminder of her humble origins. And yes, you CAN fan yourself with it!